This kind of light presumably would meet the requirements of the amended bill. You can’t look away from the legislature for even a day. If you do, you might miss legislators doing something sensible, as members of a House committee did last week on the matter of bicyclists in traffic being hard to see at night. Many of us have encountered — and nearly run into — people on bikes ghosting through a rainy night, in dark clothing and without any kind of illumination. To fix this, Rep. John Davis, R-Wilsonville, introduced House Bill 3255 to create the offense of riding a bike after sundown without wearing reflective clothing. The problem is that reflective bike gear is expensive. My guess is that most of these hard-to-see night riders wear the clothes they do because they don’t have any others and can’t afford to outfit themselves in the latest high-visibility gear. Slapping them with a $250 fine won’t do any good. The fine would likely go unpaid and eventually result in a warrant, which doesn’t help anybody. So on April 10, the House Committee on Transportation and Economic Development amended the bill and recommended without dissent that the House pass it, which it is scheduled to do Friday (April 17). 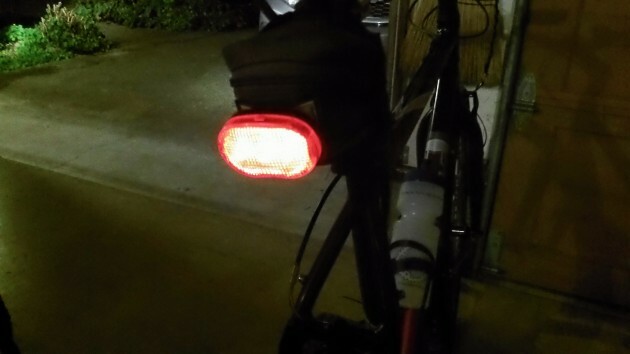 The amended version would require that bicycles be equipped with a red rear light, not merely a reflector. The light would have to be visible from 600 feet in any direction to the rear of the bike. This makes more sense than the original because a $20 battery-powered light is far more affordable than an $80 reflective bike jacket. Sensible people who ride their bikes for transportation after dark already have front and rear lights. Even the rest of us have little rear lights on the back of the bike in case darkness overtakes us on a long ride. Hasso, just put a spare light in your tool kit. I wonder if they are going to issue tape measures to the police? In heavy fog, sometimes you can’t see car tail lights from 300 feet! Why will they be allowed to drive under those conditions? With current LED technology for lights, how long (how many miles) does it take to deplete the batteries in those lights? Is there any hint of them running low? IIRC my package said “Up To 200 Hours”. I think that’s pretty optimistic. If you have something non critical, like a TV remote that uses the same size, it’d be prudent to rotate them out. The legislature never takes into consideration The Law of Unintended Consequences. Thus we get laws like this that don’t account for variables like battery strength, fog, rain, calculating distance, etc. If they did we would have lengthy, complex, inscrutable bills passed… oh wait, we do anyway. But the Nanny State marches on. And then they also do not account for the benefits of eliminating those who don’t use common sense from the gene pool (sarc alert).